The U.S. Consumer Product Safety Commission in conjunction with The Manhattan Toy Company, of Minneapolis, has announced a voluntary recall of about 2,500 Busy Loops table top toys because the round plastic beads can break, posing a choking hazard. While no injuries have been reported, the company has received two reports of beads breaking off the toy. 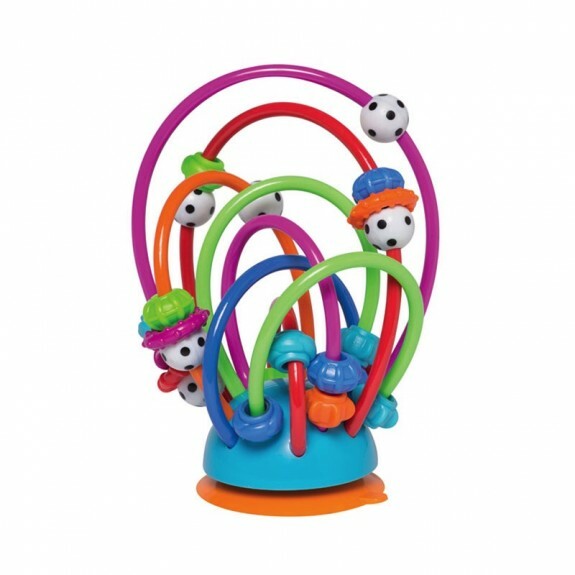 Busy Loops table top toys have orange, green, blue and purple plastic tubing with plastic beads threaded on the tubing that can slide up and down. The tubes sit on a blue plastic base with an orange plastic suction cup. The toy is about 4.5” W x 4.5” L x 7” H. The model number 700470 and lot code FH are printed on the bottom of the blue base. Consumers should immediately stop using the recalled toy and return it to the store where it was purchased or contact Manhattan Toy at 800-541-1345 from 9 a.m. to 5 p.m. CT Monday through Friday or online at www.manhattantoy.com and click on Recalls for more information on how to receive a full refund.